Jim Austin came on in relief for the Brewers in this July 1992 and gave up a walk over two otherwise perfect innings, according the Milwaukee Journal. His performance and the performance of other Milwaukee relievers helped the Brewers - and Austin - the win, The Journal wrote. "It was an outstanding effort by the bullpen," Brewer hitter Franklin Stubbs told The Journal afterward. "But it was nothing new because they've been doing the job for us all year." Austin definitely did the job for the Brewers in 1992. He got into 47 games for the Brewers in relief. He picked up five wins and a 1.85 ERA. That season marked his second in the majors. He ended up seeing just one more, arm issues and a declining velocity leading the Brewers to let him go. 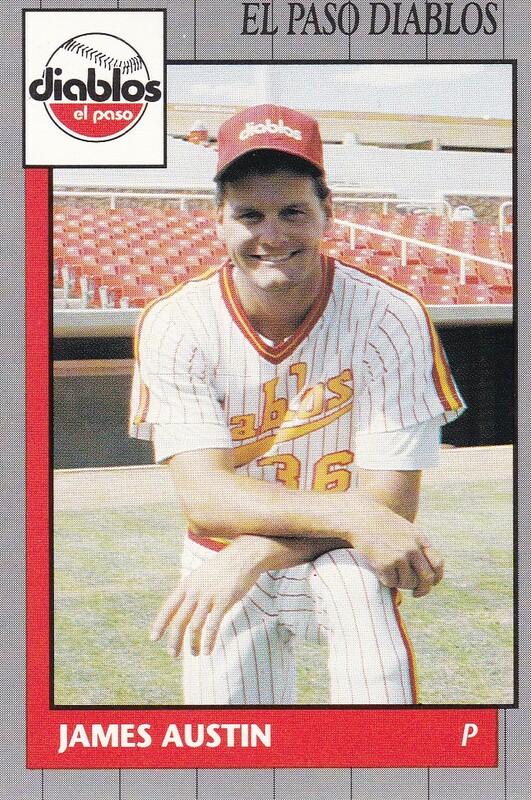 Austin's career began in 1986, taken by the Padres in the sixth round of the draft out of Virginia Commonwealth University. He was also credited by his full name, James Austin. Austin started with the Padres at short-season Spokane. He turned in a 2.26 ERA over 28 relief outings. He went 4.2 innings of scoreless and hitless relief in an August game. He moved to single-A Charleston in 1987 and turned starter. He went 7-10, with a 4.20 ERA. Austin made AA Wichita in 1988 and moved to the Brewers system for 1989 in a trade. He played at AA El Paso that year and the next. In 1990, he went 11-3, with a 2.44 ERA. 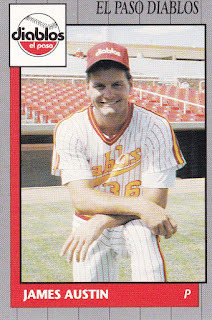 Austin moved to AAA Denver for 1991. He also debuted in Milwaukee that July. He saw five games in relief for the Brewers that year and gave up eight earned in 8.2 innings. He then returned for 1992, where he had his sub-2 ERA over 47 appearances. He got into 31 more games for Milwaukee in 1993 and his ERA expanded to 3.82. That October, the Brewers gave him his release. The Brewers looked at his age, and that his season ended early with arm issues. He also had velocity issues, according to The Racine Journal-Times. After not being recorded as playing in 1994, he returned for two more brief stints in the minors in 1995 and 1996. He played two games at AAA with the Indians in 1995 and 10 more at AAA with the Red Sox in 1996 to end his career.